Summer is a time of fun! 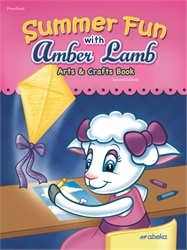 For those inevitable rainy days, give your child this exciting book featuring 54 crafts. The large, simple pictures help him preview basic concepts such as counting, seasons, colors, and animals and develop his hand-eye coordination, listening skills, and motor skills. Your child will love making a Japanese fan, coloring a kite, or creating a lion stick puppet! Features a Plan-Ahead Supply list and some tips and directions for making the projects go more smoothly. Preschool.